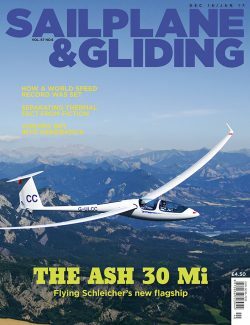 Aspire to greater things in the New Year when you read accounts in the Dec/Jan issue of S&G on how a world speed record was set and what it is like to fly Schleicher’s flagship, the ASH 30 Mi. To help you on your way, there is valuable advice on how to separate thermal fact from fiction and how aerobatics can open new doors. Belgian glider pilot Johan Luyckz has flown a number of Belgian records, three of them in Spain, but fell in love with Africa in 2005. In 2009, he set a world speed record for the 500km triangle in Namibia. In December 1015, Johan was back in Namibia to set his second world record. He flew for six hours, 45 minutes and 35 seconds over a distance of 1007.6km – a speed of 149.06km/h. The flight set a new world speed record for the 15m Class 1,000km triangle. Johan says gliding is such a splendid sport that, even with wide experience, you still can make progress and find new challenges. A Lasham syndicate had a welcome new challenge with the arrival of their ASH 30 Mi, the first in the UK. The syndicate clocked up 250 hours in the first four months of ownership. This included touring trips through Spain and France, mountain flying from Serres, as well as the 2016 UK Open Class Nationals at Lasham. This has given them sufficient time to know the glider well. Syndicate member Afandi Darlington shares his impressions of flying Schleicher’s new flagship, which he considers a worthy successor to the ASH 25. He also talks to Martin Heide, designer of the ASH 30 Mi. You can continue to improve your own flying performance with the latest article in S&G’s Ask the Coach series. Commonly held beliefs about thermals are often passed down from generation to generation, but are they myths with a tantalising grain of truth? Tony Cronshaw asks leading coach Kevin Atkinson how we can separate thermal fact from fiction to make the most of our flying. Also in this issue: Andrea Abt learns from an expert as she flies in Fayence with Baptiste Innocent. Dan Smallbone shares his favourite memories from annual trips to Santa Cilia. 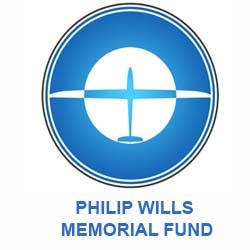 Bruce Stephenson reports on the International Vintage Sailplane Meet at Harris Hill, in the US. Bannerdown sixteen-year-olds, Sam Arnold and Matt Dews, complete Silver on the same day. Sam Franklin reports on the K-8 restoration project he is undertaking with Dan Richards. Justin Wills reports from a Glasflügel fly-in. There are four pages of results from BGA-rated UK competitions, plus the announcement of the BGA provisional ratings list. Three books are reviewed in time to be added to your Christmas list: Workshop Practice; Fifty Years of Ups and Downs; and Gliding Granny on Final Approach. Dave Latimer reports from the 2016 BGA Club Management Conference. Plus, there are many more of your stunning images in the Gallery pages. Thermals: Myth, Chinese whisper or grain of truth? Belgian pilot Johan Luyckx reflects on the Namibian flight that set a new world speed record for the 15m Class 1,000km triangle.